Instead of going out and spending money on cafes, I decided to stay home and make some cafe food today! The fact is also that my fridge finally went ‘kapowwww’ yesterday and we have to quickly clear everything before they go bad. Luckily it decided to die on Saturday and not Sunday when I’d have been done with my marketing for the week! But ok la, it die also good (它死了也好), that means we can finally get a newww fridge! We went out to get one with a bottom freezer so that it is easier for Ah-mm and 88 to get things, i.e., no need to bend to reach the vegetable compartment all the way at the bottom. I’m quite looking forward to our new fridge. it’s gonna be delivered on Tuesday! So thinking of the ingredients I have in the fridge, which is now actually a cupboard.. I have bacon, eggs, the orange capsicum that I was soooo fascinated with on Friday that I had to bring two home, a yellow capsicum (this one just 客串 cos it looked bright and fresh next to its orange cousin), and some spring onions. Oh, I also stole 2 slices of bread from 88. I decided to make something pretty with these! 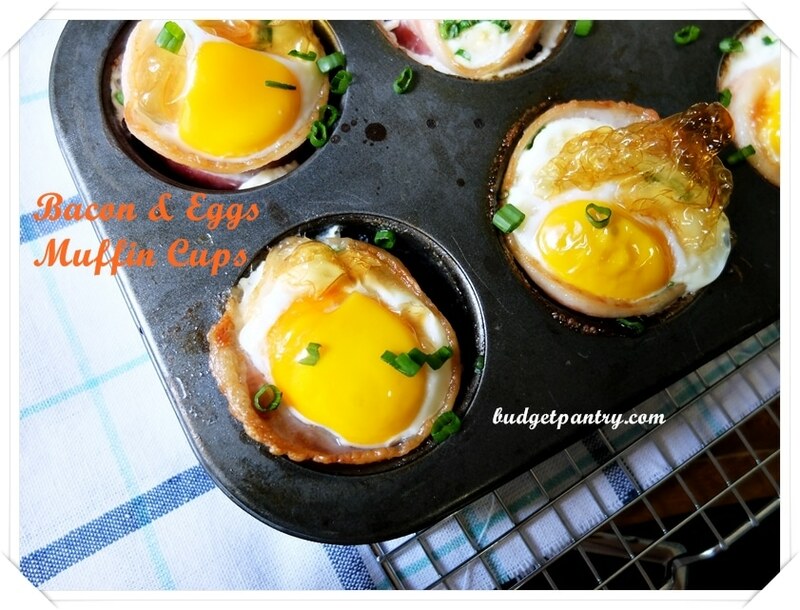 Bacon and egg cups baked in a muffin tray! You can also airfry these, but you only only AF 2-3 at a go and in those aluminum cups. I wanted to save time and money so I used my muffin tray. I realised that although these came out nice from the oven, it was lacking.. a sizzle. So what do I do? Like any Airfryer fan, I scooped each one out when done and airfried them for another 3-5 minutes so that the bacon got even further crisped up. 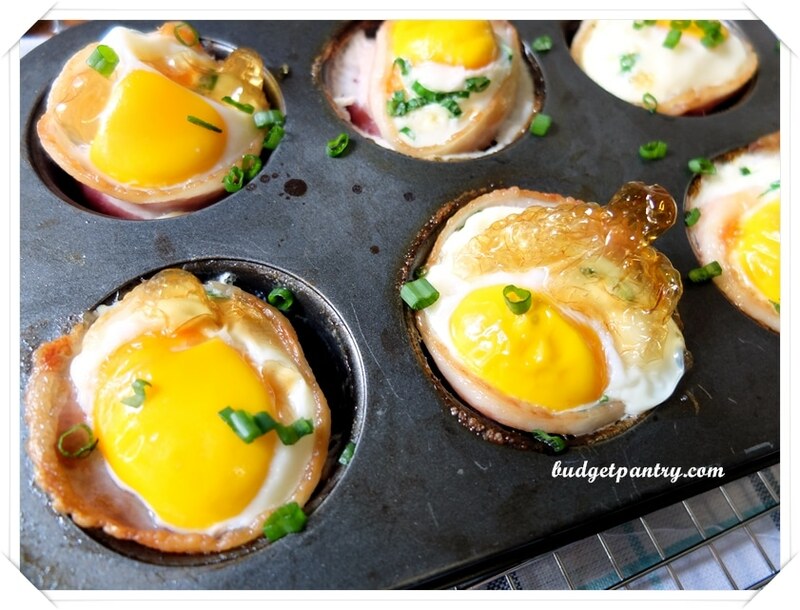 If you like your eggs more runny, you can decrease the oven baking time. These were really easy to make. You could also use blanched spinach or sliced mushrooms in place of capsicums, and add shredded cheese before cracking the egg! 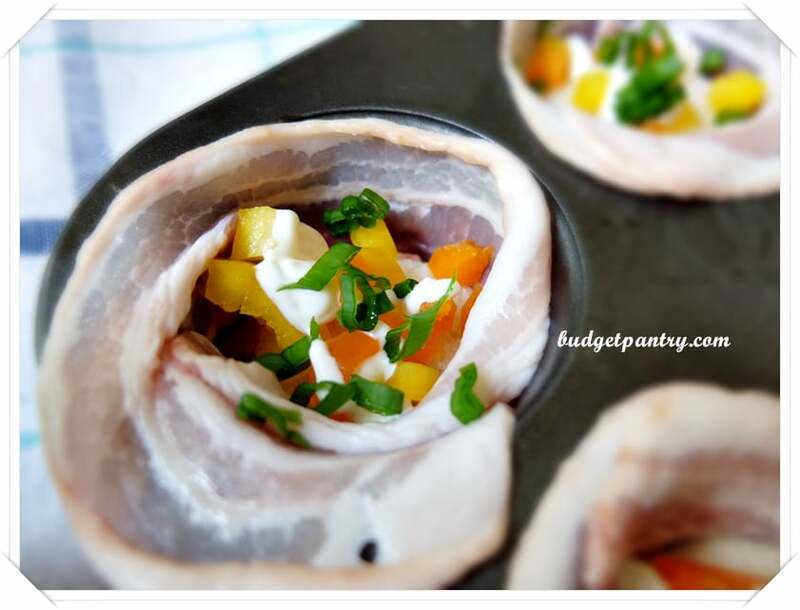 Step by step recipe with pictures right below! Preheat oven to 190C. Oil your muffin tray with olive oil. Cut out 6 little bread circles that will fit the base of your muffin tray. I used a water bottle opening to cut. 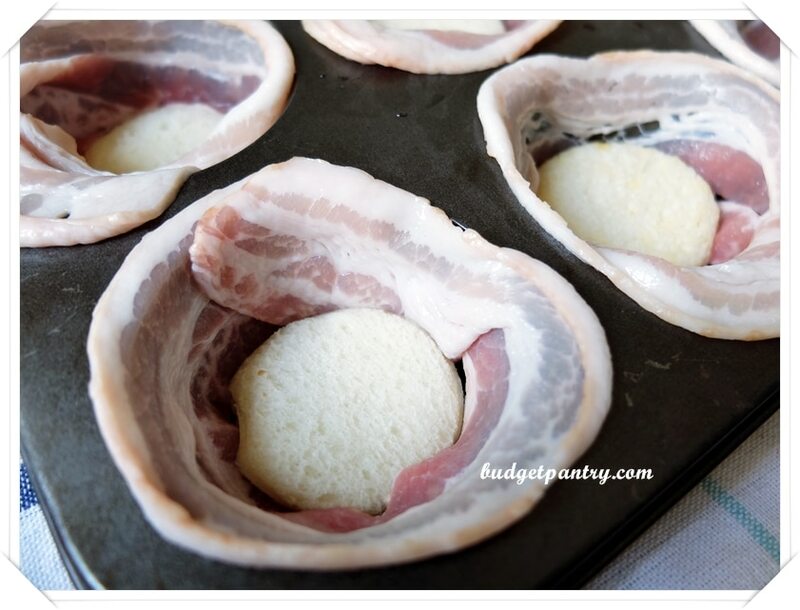 Wrap/line a slice of bacon around the sides of the muffin holes, then place the bread circles at the base. Top with chopped capsicums, spring onions and a squeeze of low fat mayo. 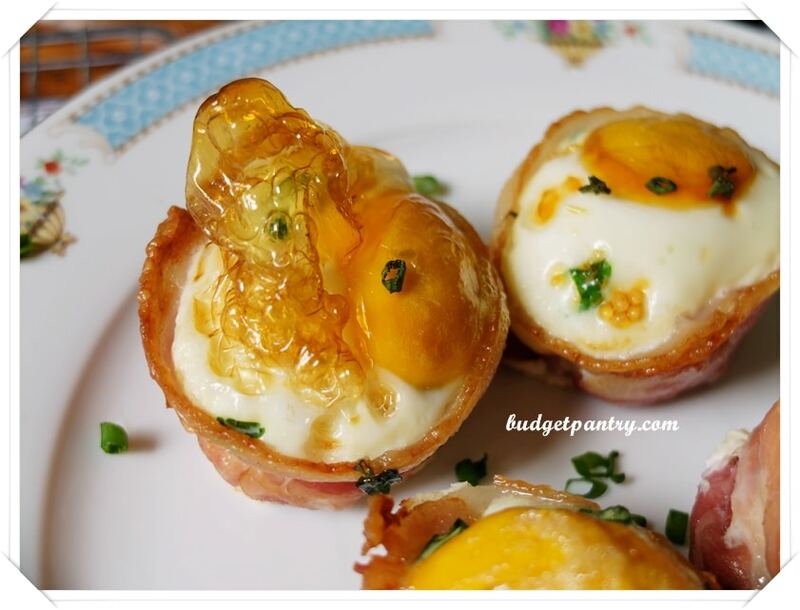 Crack an egg in each, bake for 15 minutes til eggs are done to your liking. I used top rack. Scoop out from tray using a spoon, arrange on plate, garnish with some more spring onions and serve. *Optional: If you have an airfryer and want extra crisp, after scooping out, place on the AF grill pan and AF at 180C for another 3-5 minutes til sizzling. **If using the AF entirely, you’ll need to get those individual aluminium cups. 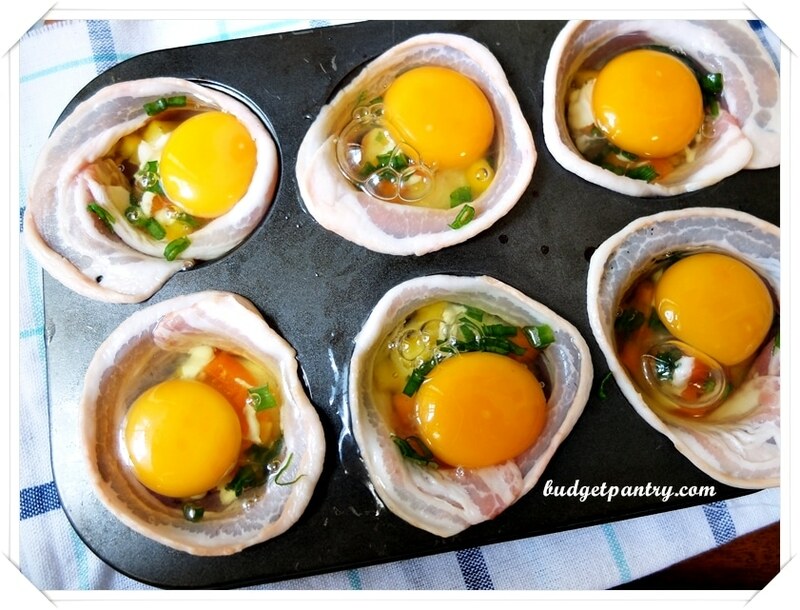 Preheat for 3 mins at 180C, then AF for 12-15 minutes til eggs are done, depending on how runny you like your yolks. Follow all the layering steps above. Scoop out or serve direct from the aluminium cups! 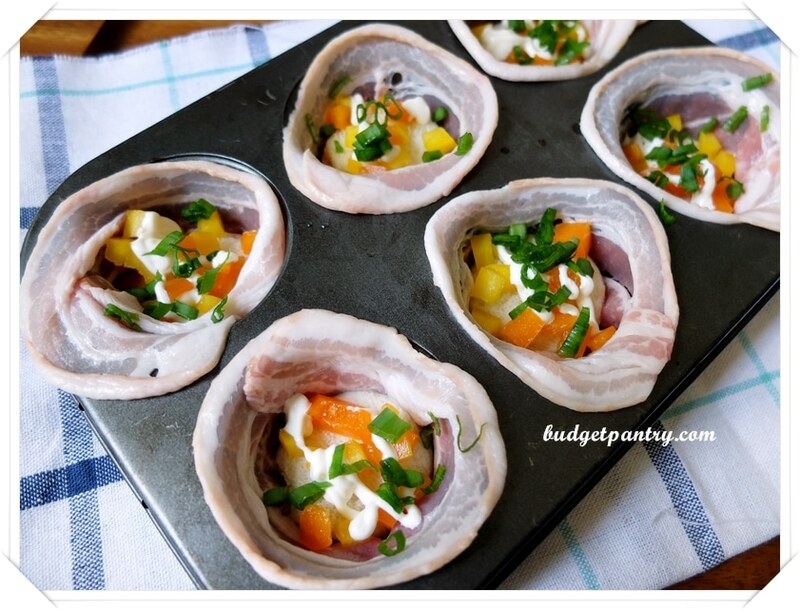 ooohh… lovely looking cafe food indeed! 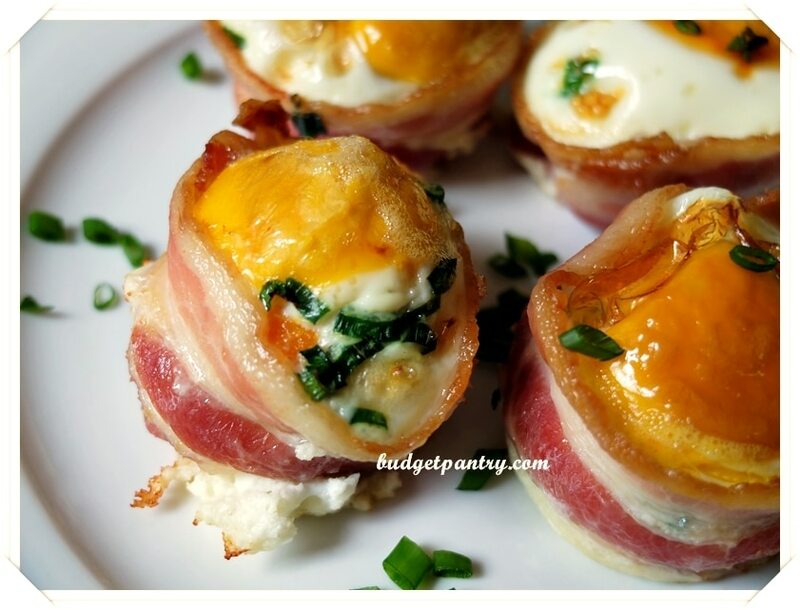 perfect recipe for the lazy saturday morning! Hi Chris, can I use my silicon muffin tray for this recipe? 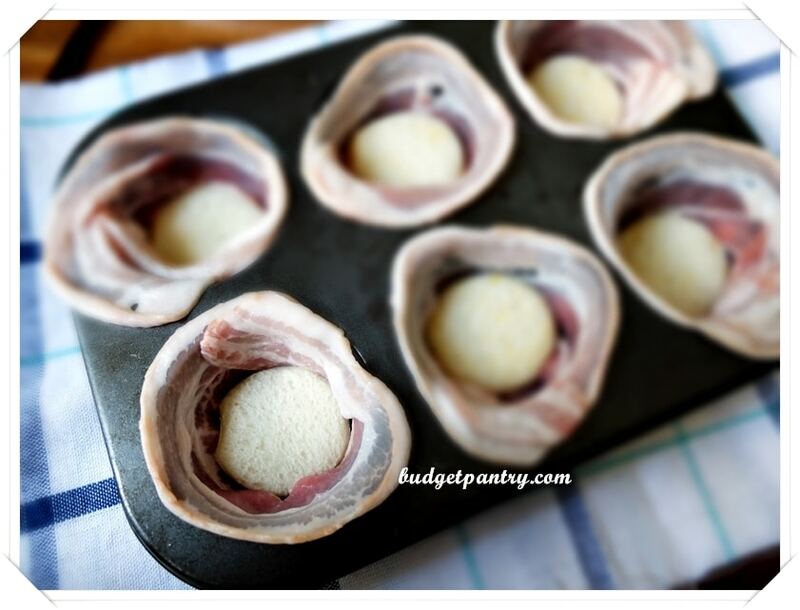 Hi Isabel, I’m sure that the ‘muffins’ will cook, but am not sure if the edges would crisp up. Sorry I haven’t tried cooking this in a silicon tray before! 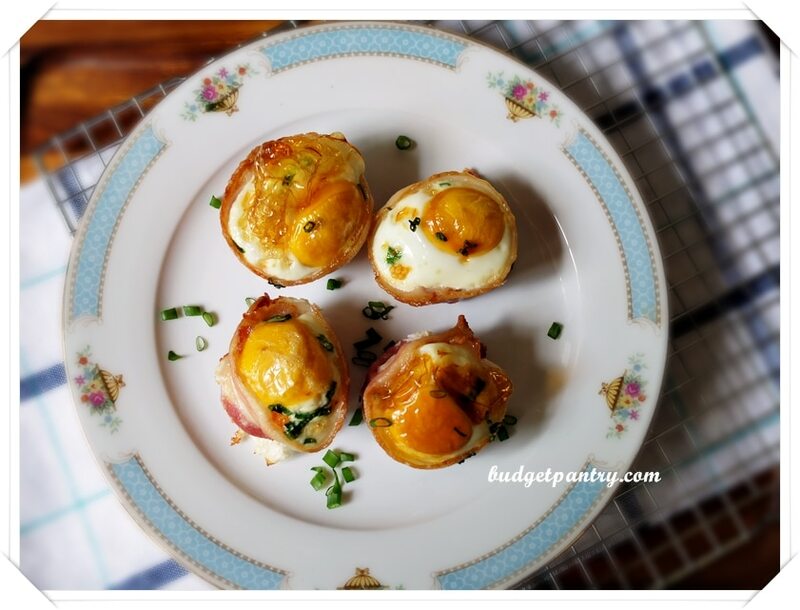 These were a super tasty breakfast. My air fryer cooked them up perfectly.